Welcome to another edition of EVERLASTING! 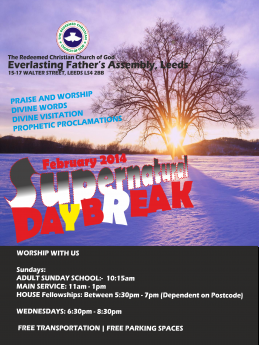 The enewsletter/emagazine of RCCG Everlasting Father's Assembly, Leeds. We pray the words in this e-edition and subsequent ones will benefit you. In this edition we have inspiring words from Pastor Samuel Obafaiye, the host Pastor, Prophet Raymond Abban, and many more inspiring posts. Join Us Tomorrow for a SPECIAL Prophetic Service. Time 11am - 1:30pm. Guest Minister:- Prophet Raymond Abban. Are you new here? 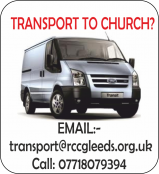 Are you looking for a spirit filled church to attend in Leeds? We will like to connect with you. RCCG Everlasting Father’s Assembly exists to connect people to God. If you are willing to serve within the Church in any capacity or you know how to play any musical instrument, please see the Pastor. Brother Tobi Akintokun; Brother Kweku Antwi; Sister Tope Babalola; Brother Emmanuel Tetteh; Bro Tokunbo Ogunsola; Bro Richard Akinduro; Sister Oluwakemi Idaodola; Brother Ukeme Okon; Brother Ayokanmi Olufori; Sister Anuoluwapo Onimole; Sister Adejoke Ige; Sister Oluchi Uwakwe; Brother Peter Pierre; Sister Modupe Daniel; Sister Beatrice William; Master Daniel Akintolu and Master Dolapo Owohunwa. The bible says in Psalm 121:3-4, “He will not allow your foot to slip; he who keeps you will not slumber. Behold, he who keeps Israel shall neither slumber nor sleep”. We should trust in the living God, for He alone is able to protect and preserve. Are You A Soul Winner For Christ? Tell Your Friends, Neighbours, Colleagues etc About Jesus. Lead Them To Meet With The Great Saviour. The fruit of the righteous is a tree of life; and he that winneth souls is wise. Pro 11:30. Be Part of this Soul Winning Project and Enjoy The Benefits of Working For Christ. For Evangelism materials please see the Pastor. GOD BLESS YOU.